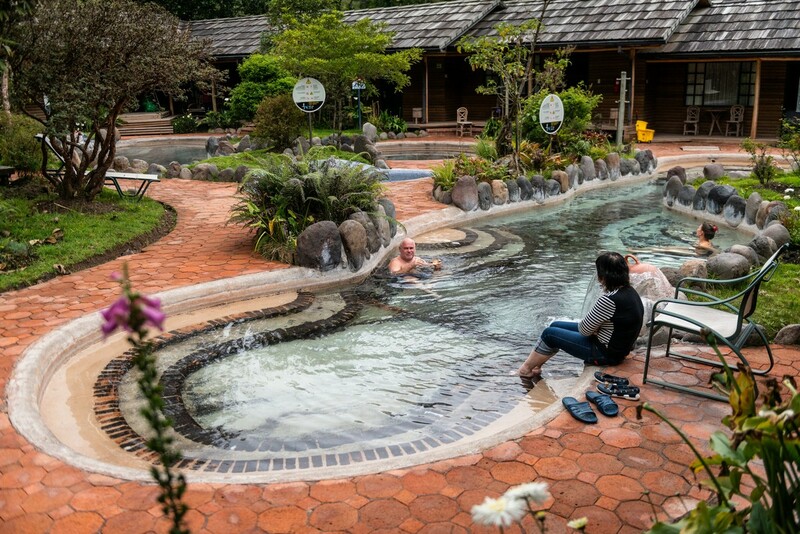 Those hot springs were in the luxurious Papallacta spa resort. High up in the mountains (~3600 meters above sea level! ), amid lush greenery and sweet aromas, we were to stay in charming little bungalows, beside which are small naturally-hot baths. A bit further away there’s a larger pool, but none of us made it there – we were too content in the little ones next to our cabins! … Then, eight hours later, we popped the corks once again! You worked out why? Yes, for the time difference between Quito and Moscow is eight hours! So, our first celebrations were for the midnight celebrations in Moscow, the second – for the hour striking midnight locally! Note: here in the pics – notice how light it is. Yes, this was midnight in Moscow, lunchtime in L.A. Quito! 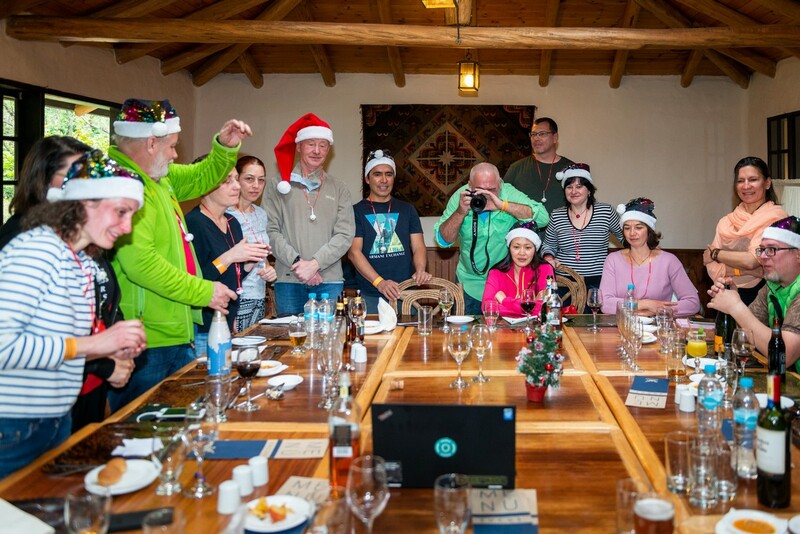 As we were so tired after our mountain marching, we kept the celebrations… modest. This even went so far as us watching a film in the run-up to the local midnight. Certainly this isn’t what we’d normally do, but, fairly exhausted, it seemed the ideal thing to do this time. We even watched it from a hot pool. And this actually turned out to be one very enjoyable, very memorable New Year! Btw, the film was Irony of Fate, which is shown EVERY New Year and is watched by practically the whole of Russia every year too – a bit like, in terms of viewership, the Wizard of Oz, E.T., and Home Alone all rolled into one! Another reason to be cheerful this New Year’s eve was the fact that we’d broken our previous record for being ‘furthest from the center’ at New Year. Now, in case you’re wondering what I’m talking about here, what I mean is – to be furthest from the center of the earth. Every year we try to get even further. But it’s not as simple as you might think, Why? Because the earth isn’t acutally round! It’s slightly not quite round: kind of flattened in at the top and bottom (the North and South Poles). In kilometers, this translates into sea level at the equator being some 21km (!) ‘further from the center’ of the earth than at the poles. 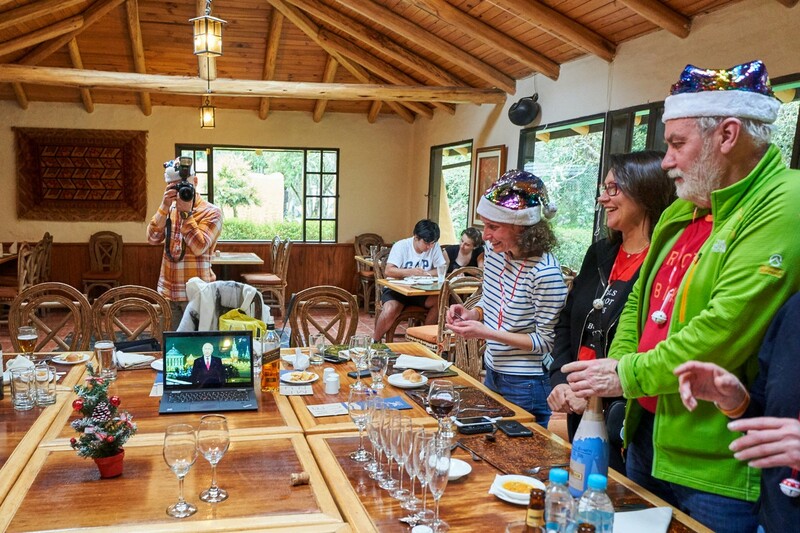 Now, back to us there watching telly in Ecuador: We were practically on the equator itself, which means a good maximal boost to the distance from the center. Add to that of course the fact that, as mentioned, we were 3600m (above sea level) up in the mountains… and you can see where this is going. Indeed, when calculated it and found we were in fact further from the center – a full two kilometers further! Papallacta: 6382km from the center!! Woah – that’s even further from the center than the peak of Everest – the highest point on the planet (above sea level)! As if to sum up our stay here, and to sum up this here blogpost too – check out the Wi-Fi password: ‘relaX’ – with a capital ‘X’!! All the photos from Ecuadorian-equatorial expedition are here.